The World Travel Awards held on Saturday September 22, 2018 was a star studded affair which sought to acknowledge, reward and celebrate excellence across all key sectors of the travel, tourism and hospitality industries. Celebrating its 25th anniversary in 2018, the glamorous award ceremony was an unforgettable event. Entities from countries within the North American and Caribbean regions competed across 47 categories, and were awarded for continued excellence in the Tourism Industry. The award ceremony also identified and lauded entities within each country that are making significant impact in their country. The regional winners then compete head to head in in the corresponding world categories. The winners will be announced on the night of the World Travel Awards Grand Final in Lisbon, Portugal in November 2018. Go! Jamaica Travel has been charting a course of excellence providing incentive travel and outbound tours since their beginning in 1995. 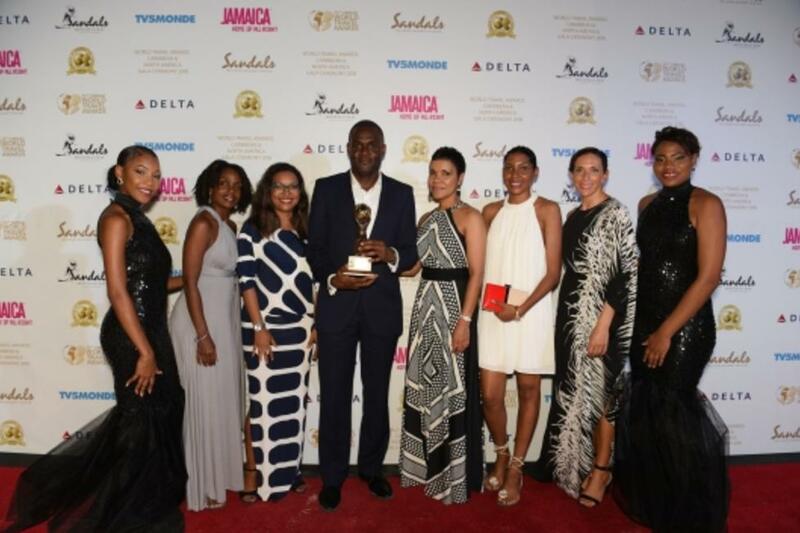 They saw an uptick in bookings for hotels, cruises and airlines, which landed them a special commendation on their contribution to the development of the tourism product from the University of the West Indies in 2012. Sticking true to the path, this organisation has steadily won the award for Leading Tour Operator in the Caribbean for four years, and recently won the Leading Destination Management Company in the Caribbean in 2017 and this year as well. Relatively new to the scene this is Margaritaville Caribbean’s second year winning the title Leading Entertainment Venue in the Caribbean. Margaritaville Caribbean offers a variety of locations in several Caribbean countries: Jamaica, Grand Turk and Grand Cayman. The locations offer amenities like Full Serve Restaurant and Bar, Live Entertainment, Swim-up Bar, Pool-side Safe Rentals, White Sand Beach, Tiki Beach Bar, Beach and Poolside Service, Hammocks, Open-air Patio Seating, Retail Store, rooftop pool, water slide night clubs, waterfall features, custom souvenirs and water trampolines. With such an extensive list of activities and features, this is entertainment centre! On the untouched South Coast of Jamaica, Sandals South Coast is a 50-acre seaside fantasy within a 500-acre reserve. In an impressive European village, you can stroll through an expansive Italian piazza reminiscent of St. Mark&apos;s square in Venice and be surrounded by the sophistication of France, the passion of Italy, and the charm of Holland with restaurants, duty free shops, and magnificent formal gardens bordering an endless stretch of pristine beach. The architecture alone exudes an atmosphere of romance, coupled with a constantly inspiring outlook because all of its 360 rooms and suites boast breathtaking views of resort&apos;s two-mile span of beach. The romantic overtures of this resort and the secluded vibe of Jamaica’s south coast is the best place for a romantic getaway which is exactly why Sandal’s South coast copped this title for its second year in a row. Plan your romantic vacation now with their special deals for your special day, here. Tryall Club is 2,200 acres of natural beauty with rolling hills and valleys tumbling down to one and a half miles of private shoreline. Tryall is the perfect intersection of sports meeting luxury, with their extensive selection of activities like tennis, watersports, and golf among others, each furnished with every other luxury amenity for guests. This entity has won this title for three years in a row now, which shows its determination for success. Island Car Rentals has become an international award-winning company by earning the support and loyalty of a host of travel partners worldwide. The company has earned top honours from the World Travel Awards (WTA), being named “Jamaica’s Leading Car Rental Company” since 2011 and, since 2014, also earning the accolade as “The Caribbean’s Leading Independent Car Rental Company.” They offer full service ground transportation by ways of car rental services and also caters to clients who do not want to drive themselves. Since 1950, Jamaica Inn has consistently been ranked as one of the top resort hotels and vacation destinations in the Caribbean. The small yet elegantly timeless resort is located in beautiful Ocho Rios, Jamaica. There are sweeping views of the Caribbean Sea from all of Jamaica Inn’s 52 suites. This eight-acre property boasts a 700-foot premier private beach, which is often considered to be the one of the best beaches in the Caribbean. Soak up the beauty of its lush gardens, full of brilliant tropical flowers, jacaranda trees, bougainvillea and palms, with a carefully groomed croquet pitch and a refreshing pool. Jamaica Inn serves up a variety of activities including water sports, tennis and golf. With amenities and services all engulfed with luxury, like these, it is no wonder that this is the second year this hotel has won the title of leading Luxury All Suite Resort in the Caribbean. Take advantage of their special deals now, find them here! This all-inclusive beachfront resort located in the quiet Rio Bueno community moves away from the bustle of the city making it ideal for families and couples, along with amenities including a variety of world-class restaurants, spa and special programmes for young children. This is the organisations second year in a row to have copped this award. Take advantage of their promotion ‘Book 4 nights and get 1 free’, find out more here! Having a longstanding reign from 2011 with this title, this convention centre must be doing something right! The Montego Bay Convention Centre is the place to book all your exquisite meetings, events, trade shows and special Occasions. The Jewel Grande is Montego Bay’s newest all-inclusive resort, offering world-class service, premium accommodations and luxury amenities. Spread across 3 buildings with a combination of junior suites, full suites, penthouses and villas, the Jewel Grande offers accommodation suited for singles, families and groups. Oceanfront Junior Suites all come with Butler Service. The Jewel Grande is an oasis with white sand beach, complete with beach concierge, 12 restaurants, eateries and bars. Guests can purchase a Golf Package to enjoy the unlimited green fees and access to the driving ranges at the White Witch and Cinnamon Hill Golf Clubs. Make the most of your getaway with these specials! It has as its mission the development and marketing of the tourism industry so that Jamaica remains the premier Caribbean tourist destination. The Jamaica Tourist Board has the longest standing reign of this title which speaks to the continuous excellence this entity strives for and achieves. Timeless elegance and understated luxury - Round Hill has been the home to celebrities for decades. The resort caters to families and with an impeccable service team; a vacation at Round Hill is an enchanting experience. The Round Hill Hotel and Villas have held this title for the Caribbean and the World since 2000, and hopefully will win it for this year as well. Take advantage of their specials here!